More 1920s and 1930s char-a-bancs/coaches. Homepage. This page: A third page dedicated to the giant charabancs of the 1920s and 1930s. Given that photographs of char-a-bancs from the 1920s and 1930s continue to turn up, it seems like high time to open a third page for them within the vintage photograph section of OCC. Day trips and short holidays were commonly taken in these mighty vehicles, which - if they were ships rather than road vehicles - could easily be described as being loaded to the gunwales, their chirpy passengers all intent on a much-needed break from the day-to-day routine of life. 1. An American vehicle in 1925. 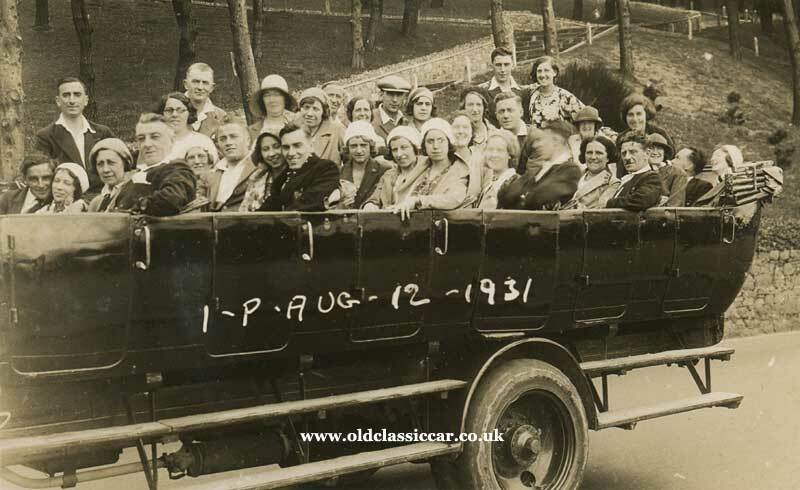 The following photograph however bucks the trend for vehicles usually being shown loaded to the brim with expectant holidaymakers or daytrippers, for there are only seven people in view, including the driver. Perhaps this wasn't such a popular operator, or route!? There's a large logo emblazoned on the side of this particular char-a-banc, the detail of which I can't really make out (a closer view of it may be found by clicking here). What can be read though is the speed limit of this vehicle - all 12 mph of it. 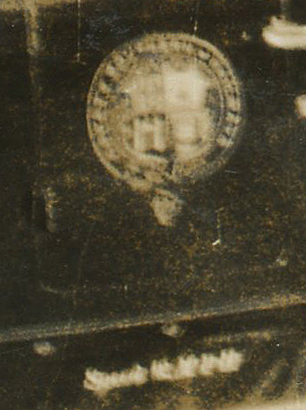 Handily there are a few clues as to the scene printed on the rear of this old photograph. The date of printing is given as 18th June 1925, the date stamp being accompanied by the stamp which proclaims "This is a genuine BORDER Fox Tone picture, Made by Fox Co., San Antonio, Texas". Unless it's hidden behind the rear panel, on which a luggage rack is mounted, I can't see any form of folding roof being fitted to this vehicle. Perhaps its build hadn't quite been completed at the time of the photograph? this may explain the modest number of passengers/occupants in the bus. Back home now, and a very well laden example of motor bus. The date is given as August 12th 1931, preceeded by the letters "I-P". As with most photos of this type, the occupants are the main focus of the photograph, which usually leads to the main identifiers of the vehicle - namely the front end details - being out of view, as is the case here sadly. 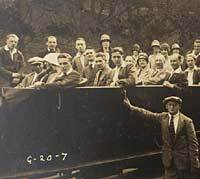 While motor-cars were becoming more affordable by the beginning of the 1930s, they were still the preserve of the moderately well-to-do, and as such the popularity of such day trips, where passengers would be packed in like sardines, wedged in alongside complete strangers in many cases, continued. Margaret dropped me a line, in the hope that the operator of the following charabanc might be known by someone. It looks like a 1920s or early 1930s image to me. 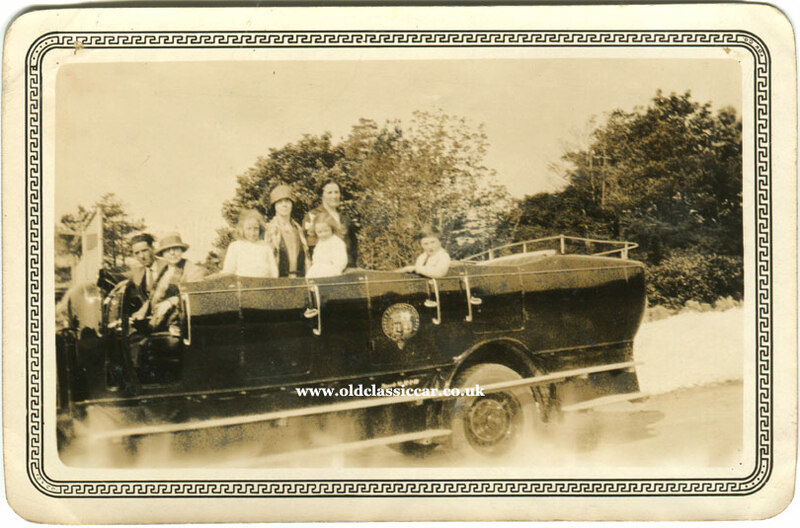 "I was wondering if you could feature this photograph of a Charabanc, which was taken between 1914 - 1920's as I am trying to locate which motorbus company might have owned it. It has an identification number of 119 but I have no idea where it was based. 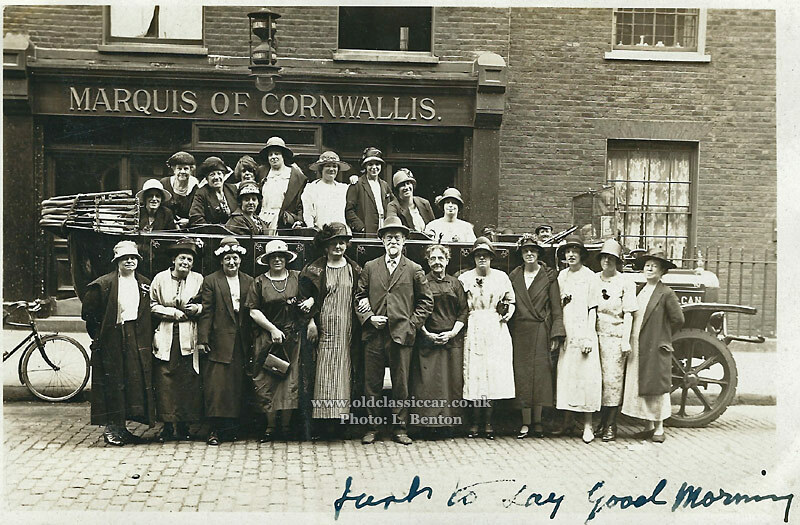 It could have been in Somerset (possibly Mendip area) around 1912 - 1918, or given the person I am researching (who is said to be in the photograph), joined the ATS and was stationed in Plymouth in 1918 and later moved to Bath it could be one of those areas. 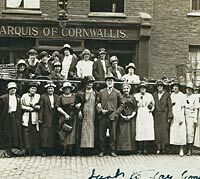 The photograph is thought to be of a church outing." Interestingly, the coachwork on this particular example, is very similar to that shown in the previous photograph. Just visible ahead of the windscreen is part of a word, ending in "GOW" I think (now confirmed as GON). Update. 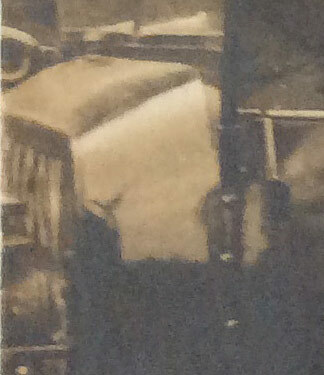 A number of people have been in touch, with more information on this photograph. There is broad agreement that the photo was taken in the West Mount area of Jersey. 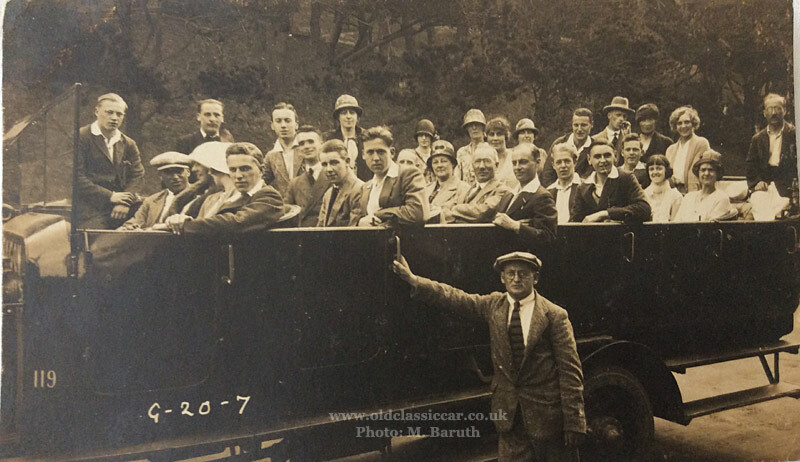 Peter adds that the charabanc was operated by Paragon Motors, a company owned by Gordon Bennett of Halket Place, St Helier, Jersey and first appeared in 1919. Thanks to everyone who got in touch about this image. Identifying charabancs is often very tricky. Usually the key identifiers for a particular vehicle are out of shot, leaving just a few crumbs (eg wheel designs, operator details) evident. Lynette emailed this snapshot over, sourced from a family album. The letters "CAN" can just be made out on the bonnet side panel, as can a mascot atop the radiator. 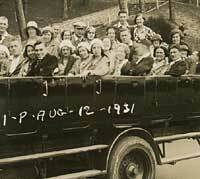 Both point to this being a Vulcan charabanc. With the exception of one cheerful gent in the middle, the entire passenger list for this particular trip was female. Perhaps it was a "works" day out, with the two characters in the centre funding the excursion? In the background is the Marquis of Cornwallis. This name has featured on many inns over the years. Unless I'm much mistaken, the premises survive to this day, now with the name "Smuggler's Tavern" (or "Smugglers' Tavern") over the door, located at 28 Warren Street in London W1. What a great picture, thanks for that Lynette. A photo of a Vulcan motor-car may be found on this page, also here at OCC. 5. A Hudson in the Blue Mountains of New South Wales, Australia. 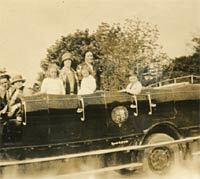 Margo Connell posted an old family photo onto Facebook, and Varun (a regular on the OCC FB page) identified the magnificent 1920's charabanc that features in it as a Hudson, specifically a Hudson Super Six, 6-Door, 14/16-Passenger Charabanc, circa 1923. The location is the Blue Mountains, of New South Wales (NSW) in Australia, around 31 miles or so to the west of Sydney. Margo's grandmother and great grandmother were holidaying in the area, at the time of their ride into the mountains. Unusually for a charabanc operator, there's no mention of their name on the side of the vehicle. Thanks for ok'ing me to share the photo here Margo. 6. 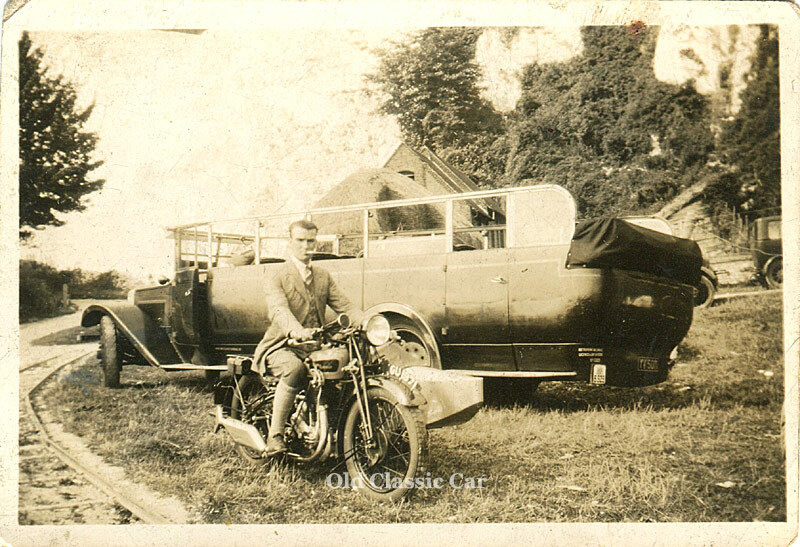 An unidentified 1928 char-a-banc, and a Royal Enfield motorcycle. 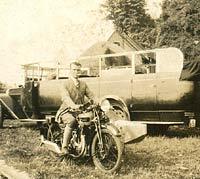 The following old photo raises a number of questions, not least the identity of the magnificent char-a-banc that is parked behind the chap astride a Royal Enfield motorcycle (with sidecar). The motorcycle's registration is GU 1971, a London issue that ran from March through to May 1929. The vehicle behind is also registered in the London area, YV 9011, a series that - like the Royal Enfield's - lasted between March and May, but in this case the year previous to the 'bike, 1928. To the left of the char-a-banc's numberplate is another, this time square, plate which appears to be an operator's licence plate of some kind. The coach's roof is fully folded back out the way, offering the passengers and driver alike a clear view of the sky, as the trip progressed at, no doubt, a relatively sedate pace. 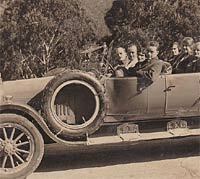 Fortunately for the occupants, by the time of this vehicle's build, pneumatic tyres were fitted, not something that could always be found on char-a-bancs that were built just a few years earlier. Who built the char-a-banc? Who operated it? Who is the chap on the motorcycle? And what are the two cars just visible a little further away, to the right of shot? So many questions. Return to Page 18 in the photographic archive, or visit the main index of images here. 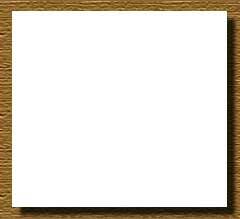 The first two pages of images similar to those shown above, may be found here and here, all at OCC.